We needed something that was a blend of ‘product’ and specialist development. We’ve known the people who develop the software for some time and they have the skill. 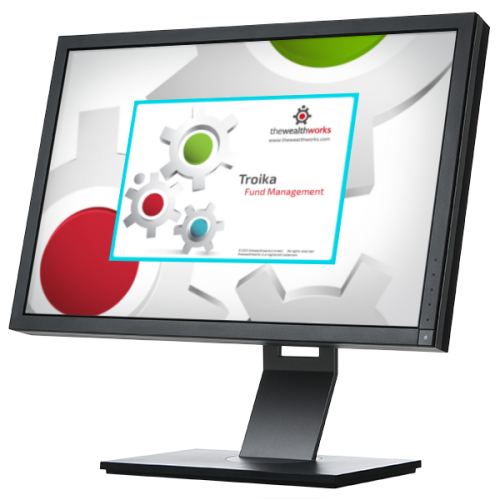 Whatever the type of collective investment scheme you manage – thewealthworks will help you centralise control and management of all fund administration and fund accounting, and offer a personalized service to your clients. thewealthworks puts you in control. It gives you all the functionality you need to save time, money and improve customer service. It is unique in the fact that funds and client portfolios are managed within the same system. Functional power and range from an integrated software application linking everything in one package, including fund administration and accounting, banking, treasury, and trust and company administration and accounting. Management and administration of all main unitized or mutual fund types, both UK and European offshore and international fund variants. Supports a range of NAV calculation models, with or without expenses, or for OEICS with or without a dilution levy as appropriate. Support for single or bid and offer based prices is standard. NAV prices calculated internally or able to be imported if required. Funds are structured as a system client and can have linked single or multiple fund assets or classes. NAV calculations can be set to a fixed date and time, calculated ad hoc or over variable and user definable periods. Funds can be valued at user defined periods, at a set date and time or on an ad hoc basis. Funds can be priced on an historic or forward basis as relevant to an individual fund’s prospectus. Underlying portfolio analyses and transaction records available online with appropriate drill down where required through to the underlying client and fund records. Tax withholding provisions and associated audit trail, facilitates subsequent reclaim processing. The system supports work efficiencies and enhanced work throughput. Complex fee options including front end fees with fee splits and allocations, exit fee calculations and trailer fee apportionments, are simplified through a range of automated and semi-automated processes. Fees may be calculated and applied on a standard table basis from within the system or calculated and applied on an individual trade or spot basis. Ad valorem fee options are available alternatively. Enhanced fee analysis will provide a complete online breakdown of all fee type activity by client or client grouping, transaction, fund or portfolio and by fee type. Linked to broker reports and analysis, the system will also provide a detailed breakdown of all broker commission against transaction numbers and turnover. Standard reports will rank brokers by level of business against commission rates and levels generated. All accounting transactions update across all relevant ledgers giving virtual real time updated ledger values. Equalisation calculated as standard on an averaging or actual basis. Distribution records maintained, managed and posted automatically or accumulated as a ready alternative as required. Broker and custodian settlement records generated and maintained in the system. thewealthworks offer comprehensive and simplified record keeping and fund administration. Provides full online share registers and all related movements for unitized investments. All share register activity fully recorded and able to be reviewed online. Selective data views provide comprehensive access to all fund activity and client holdings on a unitized basis. Look through functions links to all related and underlying portfolio and asset data within any shareholders’ portfolios and vice versa. Limited partnerships’ functionality as standard using specialist registers designed specifically for limited partnerships including recording Partners’ Commitments and full histories. Private Equity commitment accounting designed to underpin standard data entry procedures so that they can be linked to investments if required. The system supports simple and asymmetric shareholdings and provides for management fees, distributions and capital return, fund’s drawdown with audit trails, details of contract life. Inquiries and data views can be constructed on a range of dimensions, individual client, family office or principal based with links or related parties, at a management company level, or on a nominee or selected entity or structure basis. The system streamlines core administrative banking and fund processes. The integrated banking interface links to core deposit and fixed interest provisions, reinforced by the ability to operate “pooled” or single accounts for clients, underpinned by effective multi-currency processing and simultaneous ledger posting and updating throughout. Fund or instrument dealing and order processing can be compiled into sequenced instructions to help execution and simplify contract note management, order confirmation and settlement. Standard interface supports automated imports of a range of price feeds, corporate actions and dividends data. Standard automated routines link import and update of imports to related portfolios, fund and client holdings and positions to allow for efficient automated dividend distribution and capital changes. Trades and related data can be imported for internal portfolio mirroring or real transaction updating purposes, where brokerage or other trading services may be conducted externally to the system. The system can be configured to export unitized trade data to an external funds exchange such as EMX or interface to specialised trading systems such as Capstone. Share subscriptions, redemptions and liquidations are supported by histories: the ability to calculate a NAV at any time, store the calculated value but not override existing or prior NAV values. All NAV calculations are date and time stamped for audit trail purposes. With thewealthworks you will benefit from centralised operational administration that supports an enhanced client service. In-house centralized high quality reporting delivers time saving, cost reductions and service efficiencies over hosted alternatives. Report capabilities extend to all and every part of the system making internal and external control comprehensive for all system events, actions and processes. Structured order management processes produce a more responsive and accountable dealing environment from initial order creation through to final statement production. One core database integrating all modules, simplifies the record keeping and reconciliation requirements for more effective stock control and final custodial conformance. Core contact management functions track, administer and report on deadline task conformity or undershooting, reinforced and monitored by an integrated diary and resident task based, workflow processes. The system allows user companies to meet international or national regulatory provisions, where set compliance standards require to be adhered to regarding collective instruments’ reporting yet retains the inherent flexibility to generate ad hoc reports designed to reflect local reporting needs independent of such regulatory considerations.